February 10, 2019 by admin | Filed under graf. 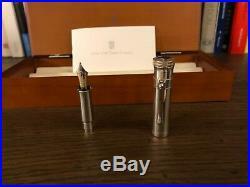 Sterling silver nib unit and cap for a Graf von Faber-Castell Classic. The nib itself is of course 18 karat gold. Nib gauge is extra fine. The grip is sterling silver. The cap is also sterling silver. 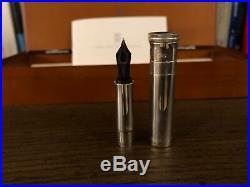 Originally intended for the Sterling Silver fountain pen. Compatible with all Graf von Faber-Castell Classic pen barrels. The cap has some light tarnishing (as all silver does with time). Box and papers included. The item “Graf von Faber-Castell Classic Sterling Silver Cap and Section” is in sale since Monday, December 10, 2018. 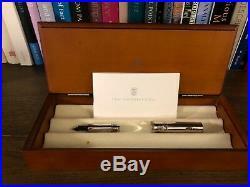 This item is in the category “Collectibles\Pens & Writing Instruments\Pens\Fountain Pens\Faber Castell”. The seller is “daniel3.14″ and is located in Arlington, Virginia. This item can be shipped to United States, Canada, United Kingdom, Denmark, Romania, Slovakia, Bulgaria, Czech republic, Finland, Hungary, Latvia, Lithuania, Malta, Estonia, Australia, Greece, Portugal, Cyprus, Slovenia, Sweden, Belgium, France, Ireland, Netherlands, Poland, Spain, Italy, Germany, Austria, Mexico, New Zealand, Switzerland, Norway, Ukraine, Croatia.